Do you like fairy tales? Playtech has a new take on the old children’s story by L. Frank Baum. 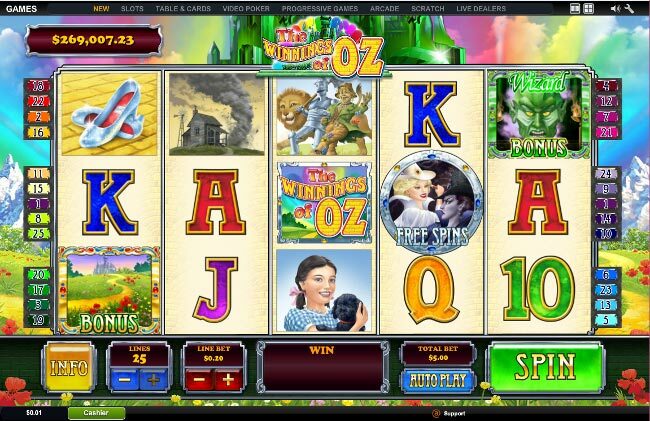 You are in a mysterious world called The Winnings of Oz Slot Machine. Get to know the main heroine and her friends in this no download adventure. Conquer all the difficulties to get what you want. The road is guiding you to the land where all wishes come true. Are you looking for courage, heart or brains? Help all the characters pass the 5-reel barriers. Go ask the wizard for help and if you meet all the requirements, the 25-linepath will lead you to the magician. But perhaps you prefer sea adventures or travel themes – in that case, check our high roller slot list, and try whatever is to your liking. It’s all up to you, and it’s a piece of cake to catch the Bonus Logo on reels 1, 3 and 5. The Yellow Brick Road gives you a chance to follow Dorothy and, spinning the wheel, you decide how far she will get. Collect her companions and increase the amount of your bonus cash. In case you do well and reach the Emerald City, you will activate Wizard Bonus. Here you pick 4 coins and reveal either the cash prize or a character. Find Dorothy herself and grab the biggest scoop. What is more, you can also catch a combination of 2 Bonus Logos and a Wizard Bonus Logo on the 1st, 3rd and 5th reels to trigger the feature in Base Mode. 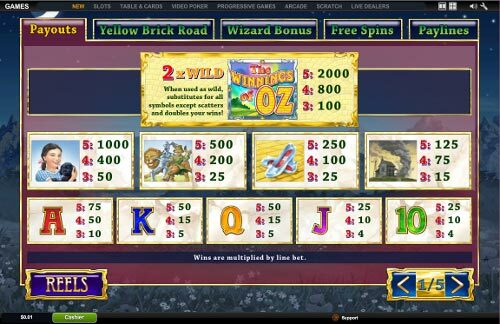 Good and evil always come together, and if you hit the Witches on reels 2, 4 and 5 at the same time, they will open Unlimited Free Spins for you. Collecting 5 Wicked Witches, you strike the Super Spin, which means that you will see all good sorceresses covering the screen for a higher prize. When you’re on such a long trip, you can’t go without the wild symbol. 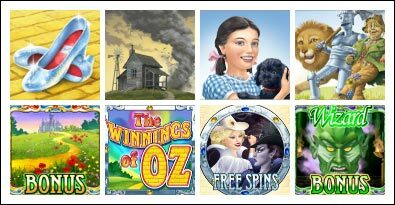 The Winnings of Oz Logo is ready to create new profitable combinations due to its replacing power. And it doesn’t stop there. Each time the Logo participates in a combo, it doubles the catches and makes them even more beneficial. Another thing to remember is that during the Free Spins, the Good Witch also acts as a wild. She also substitutes for the other icons and lead to more frequent winnings. Nevertheless, her opponent Wicked Witch is the scatter symbol in this case. When up to 5 such icons are collected, it ends the feature, but she still rewards you with 3x, 10x, 100x or 500x Multiplier. Such a serious mission must be completed. But first, you have to find out how much the wizard wants for his job. With a $0.01 coin size, you don’t have many chances to convince the magician. Things change with a $40 per line bet. 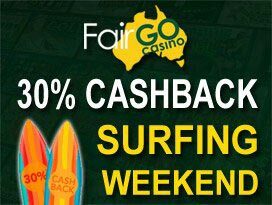 Now your bet is $1,000, and if you hit 5 The Winnings of Oz Logos, the top jackpot will be transported to your balance automatically. That is no joke, everyone wants a quick $80,000! Unlike other games, this one offers you no fewer than 3 ways to hit the Progressive Jackpot. So, see if it’s your lucky day and start the hunt for treasures. Once you collect all the heroes in Yellow Brick Road and get to Emerald City, you are the winner. Or, you can simply find the characters in Wizard Bonus. Another method is landing on the progressive in Yellow Brick Road. Just remember that to get what you wish, you have to place the max stake.